The Bankfile is used to store information on all banks with that the company may have an account with. This application allows entry of information into this file and then maintenance of this data. This bank file will be used throughout the BB application. The Bankfile contains information such as the G/L Account Number, G/L Opening Balance, Last G/L Update and General Bank Information such as Bank Name, Bank Account Number, Bank Contact, and Bank Phone Number. This file is used in many applications and reports. It is used to correspond the proper G/L with it’s correct Bank Account information. There is one main screen used in the Bankfile application. Enter the G/L and individual Bank Account information here. Select the Bankfile from the BankBook Maintenance window. This number is used throughout the Bank Book Package to refer to the G/L Cash Account. Every bank account that you want to process in the Bank Book module needs to be defined here. Pressing the F7 key will allow you to search for the Main G/L Account by number or pressing the F8 key will allow you to search for the G/L Account by description. This is useful in the change or delete modes to find a G/L Account when you do not know the account number. This account is used to accumulate totals for bank accounts after the open item file is posted. At the time of Bankfile creation the current G/L Opening balance must be entered here. This should be the ending balance in your G/L account. This is the last date a G/L Balance update for the above account was done. The date in this field will be maintained by the system after doing an update. If for setup purposes only, enter any date. This field will default to the system date. In most places in BB package where the bank name is entered, the F8 key can be pressed and a search for the vendor by this name is allowed. If you have a large number of banks accounts and will be using F8 key search, it would be best to keep the name as simple as possible and enter it in a format that will allow it to be alphabetized, e.g., Bank of California instead of The Bank of California. This will also make for a more meaningful Alphabetical Print-Out. This name will also appear in reports derived from this package. Enter the bank account number here. You may enter more than one account for each bank name by creating a new Bankfile for each bank account. Enter the person who is to be contacted in regards to this bank account. Enter the phone number for the contact that will be used. Fields 4 and 6 – 7 For reference only and not mandatory. However, these fields will appear on some reports. This option should be run whenever a cash account is tied out to the bank statement, e.g. at month end or whenever G/L journal entries were made that affected the cash account balance. The General Ledger Balance as of the cutoff date entered, will be re-calculated and saved in Bankbook as the new starting balance. Optionally, you have the ability to manually enter a starting balance that can be taken from the G/L account inquiry or Trial Balance, Ending Balance for a specific cash account. The General Ledger Balance as of the cutoff date entered, will be re-calculated and saved in Bankbook as the new starting balance. Optionally, you have the ability to manually enter a starting balance that can be taken from the G/L account inquiry or Trial Balance, Ending Balance for a specific cash account. All distributions in A/R, A/P and Payroll (if installed) will be totaled to provide a current up-to-date bank account balance as if these distributions had been interfaced. Select “Y” to calculate new balance. The system will calculate the new balance and display it and the new G/L Update date. The system will now ask you if you want to update. Select “Y” or “N”. Please be aware that all interfaced distributions will be processed as part of Bankbook. It is vital to keep your distribution files as clean as possible. Entries for the wrong dates e.g. 1903 or 1904 must be purged using the purge option on the distribution reports, since such errors are usually corrected via journal entries. To keep Bankbook running at an acceptable speed, we also recommend purging your distributions on a monthly basis once they have been interfaced and posted to the General Ledger successfully. Select Update-balance application from the process window. Enter the G/L account you would like to update. This is the opening balance in the G/L account specified above. This is the last date a G/L Balance update for the above account was done. The date in this field is automatically posted after doing the last update. States here the Bank name specified in the bank file for this cash account. States here the Bank Account No specified in the bank file for this cash account. 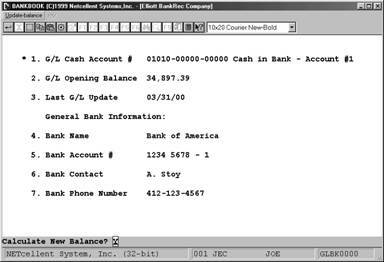 States here the contact specified in the bank file for this account. States here the contact phone number specified in the bank file for this cash account.